SERVING THOSE WHO SERVED. The eleventh of November marked the ninety-ninth anniversary of Armistice Day, signifying the end of fighting in World War I. Many celebrate Veteran’s Day, honoring our veterans who have fought for our freedom, but many don’t know that Veteran’s Day came about in Emporia, Kansas. 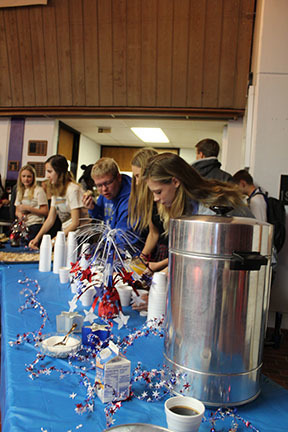 Valley Heights students and staff celebrated and honored our veterans on Friday morning, November 10, 2017, hosting a breakfast and program for local veterans sponsored by the Kansas Association of Youth (KAY) club. The morning started off with veterans being welcomed by students and enjoying a breakfast made by the high school kitchen staff and the junior high FACS class. The KAY members got the opportunity to serve the veterans, expressing their gratitude. “It’s a great opportunity for students to connect with veterans and bring the generations of our community together,” says KAY President, Rosa Blaske, junior. 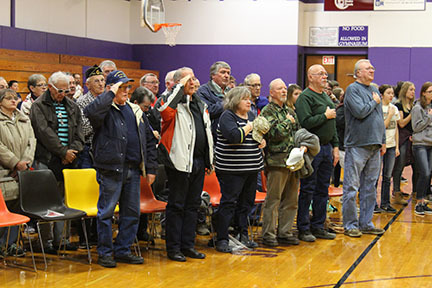 Following the breakfast, veterans and students of all ages got to chat and speak with one another then everyone filed into the gym where veterans stated the branch of the military in which they served and how long they served. Veterans attending ranged from World War II veterans to those who served in Afghanistan only a few years ago. To add to the program, Shea Manley, senior and KAY Student Council Representative, shared the story of Lyle Gadbout, former Valley Heights bus driver who was a World War II veteran. Shea had interviewed him last year for a Junior English project and wanted to share this remarkable story with the whole school. Capping off the day was the high school band that played the song for each branch of military. “This is the fourth year KAY club has sponsored this celebration. I’m so happy our students recognize all those veterans have given up for us and choose to be thankful and give back to them,” says KAY sponsor and Jr. High English teacher, Marcy Manley.